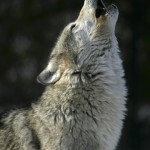 Natural raw dog food is the living prey animals for whom carnivorous animals in the wild hunt and eat. It is the unquestioned natural staple of their diets, and has been since long before mankind set foot in their territory. By this very definition, what a wild animal eats can be nothing other than its natural diet. Evolving through the evolutionary timeline, a carnivore’s body has been designed to derive its required nutrients from the raw food it kills, and sometimes what it finds as the remnants of natural death or the leftover scraps of other predators. These truths are unquestioned, and they have remained unchanged for literally millions of years. Dogs are natural carnivores. This, too, is an unquestioned truth. Therefore – again, by definition – if they eat anything other than what for them is a natural diet, which in the case of a carnivore means raw meat ripped directly from the bones and carcasses of a fresh kill, then they are existing in a non-natural state. I know, it’s hard to imagine that little fur ball that goes with you in your purse ripping it’s fangs into a writhing rabbit of equal cuteness, but that’s all a value system we’ve assigned, and it flies in the face of the one assigned by nature. Our dogs’ bodies have been designed for one thing where nutrition is concerned, but when we feed them something else we are departing from what is natural, and therefore depriving them of their optimal diet. Anyone who knows anything about nature knows that disturbing the balance of natural creation and evolution never turns out well. And in this case, when we’re talking about a natural carnivore that happens to be living with us in our homes as our pet, we’re depriving our beloved dogs of what their bodies crave when we feed them anything other than raw natural dog food based around the essential elements of meat and bone. This isn’t an issue of taste or comfort or reward, it’s an issue of health, strength, well-being, immunity and longevity. 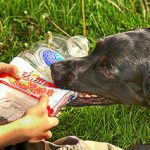 Compromise the natural order of your dog’s diet by feeding it canned or bagged dog food manufactured in a plant with the assistance of additives, chemicals and supplements, and you are disturbing the natural order of things. Your dog’s health will suffer for it. Period. 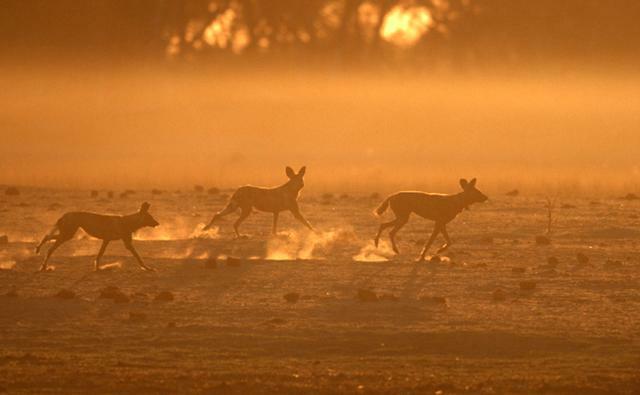 Watch the video below of young wild African dogs playing in the early morning sun. Only 3 to 5 thousand of this beautiful endangered dog, canine cousin to that fur ball in your lap, remain in the wilds of Africa. 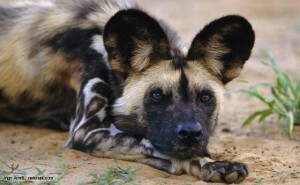 These “painted hunting dogs” form packs of up to 40 and the dominant breeding pair stay monogamous for life. A clever social animal like us, these dogs work together in harmony to keep strong social bonds and co-operate when out on the hunt. Watch the amazing BBC film footage in the video below of the dogs as they take up the hunt for Impala. 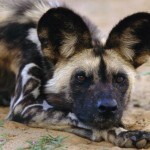 It’s impossible to follow a wild dog hunt at ground level through the treacherous swamplands of the Okavango. Using the helicopter-mounted camera, the crew managed to capture the entire hunt from the air. Hunting usually commences at dawn or dusk and involves running down the prey over time at speeds of up to 55mph. 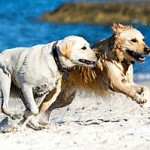 Find out more about your dogs natural biological diet – a raw dog food diet – get the free report below.